Many people probably thing that international trade and technical innovations is something new: it’s important now, in the digital age; it was important in the 20th century, and perhaps influential as far back as the industrial revolution of the 19th century. But those that study the history of decorative arts know that international trade and technical innovations go back much further! Imagine yourself back in the late middle ages. And you’re thirsty. You don’t get yourself a drink of water, because most likely the only water available to you is polluted and will probably make you sick. So, instead you get some fermented beverage, such as beer or ale. The fermentation process kills off the bad things in the water and lets you drink with relative safety. But innovation found a solution to this problem. In the 1200s, German ceramic producers discovered ways to bring their kilns to a high enough temperature to cause vitrificiation. Vitrificiaton is when the minerals in clay melt together. This means that the porous material becomes nonporous. Not only did this new material not absorb liquid or smells, it was also extremely hard. It was, in fact, as hard as rock. Consequently, it became known as stoneware. Stoneware does not need a glaze–a mix of materials covering the clay, that melt in the kiln to form a glassy surface–to keep itself non porous. Ceramicists, however, found out that introducing salt into the kiln during the firing of stoneware produced a beautiful shiny surface. Mostly this surface is decorative, although it does help in keeping the vessel clean. 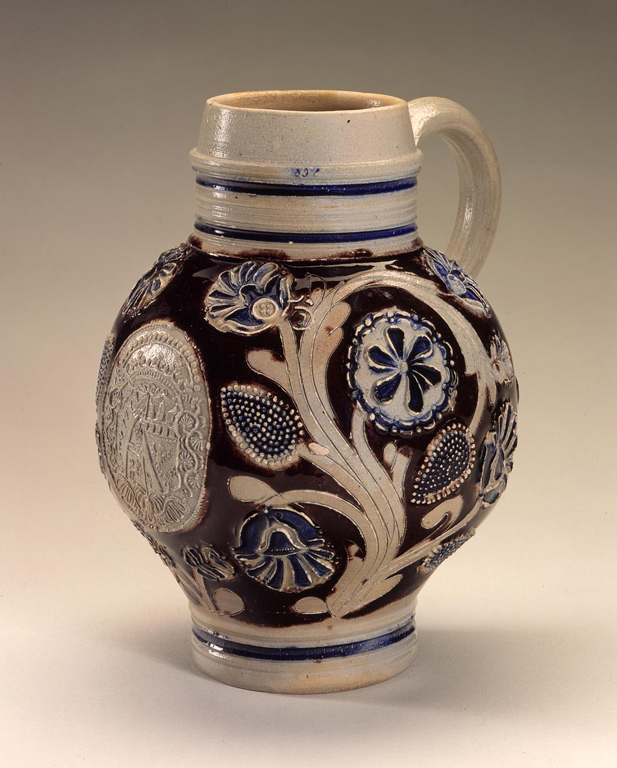 Stoneware became so important for storage and drinking vessels that by the 16th century German stoneware was being exported all over continental Europe, England, and colonial America. Possibly because stoneware were more expensive than earthenware, the German potters took advantage of the properties of stoneware to make their vessels into art objects. Now, certain types of decorations help identify the origin of the ceramic. For instance, in the Westerwald area, gray clay is decorated through molds and incising. The areas of relief are accentuated by contrasting areas of gray clay with a dark blue glaze formed from cobalt oxide. The Milwaukee Art museum has two nice examples of Westerwald stoneware in the form of Krugs (German for a handled drinking vessel). One in the Collection, seen above, emphasizes the floral decoration in the color of the clay with a background of deep blue; the front sports a cartouche for an unidentified family or city. 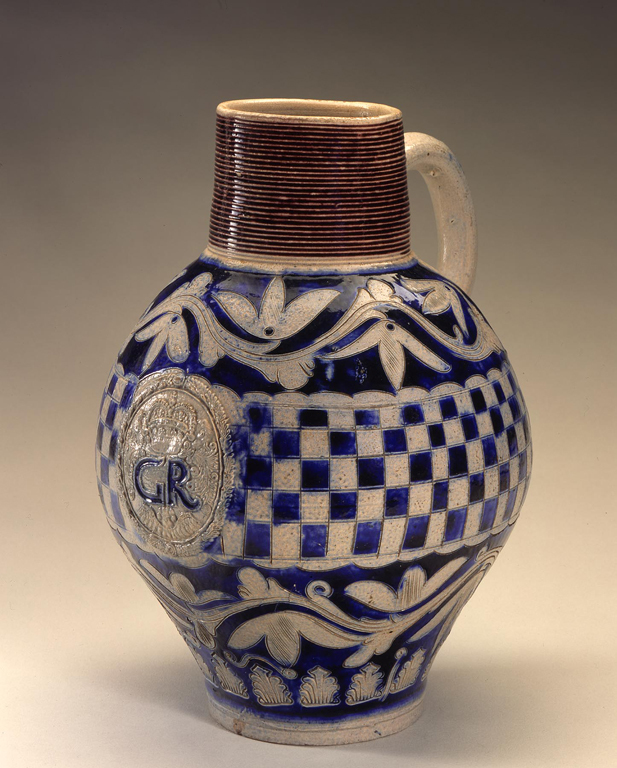 The other, seen below, combines a band of blue and gray checkerboard with organic ornamentation, and features a cartouche with the letters “GR”, standing for George Rex, the king of England. The decoration of both Krugs masterfully takes advantage of the bulbous shape of the vessel. In Raeren, the clay is usually covered with an iron-stained slip (watered down clay) which creates a reddish-brown surface. Our lovely late 16th century jug, below, balances tiers of incised lines with a lively scene of peasants dancing around the widest bulge. 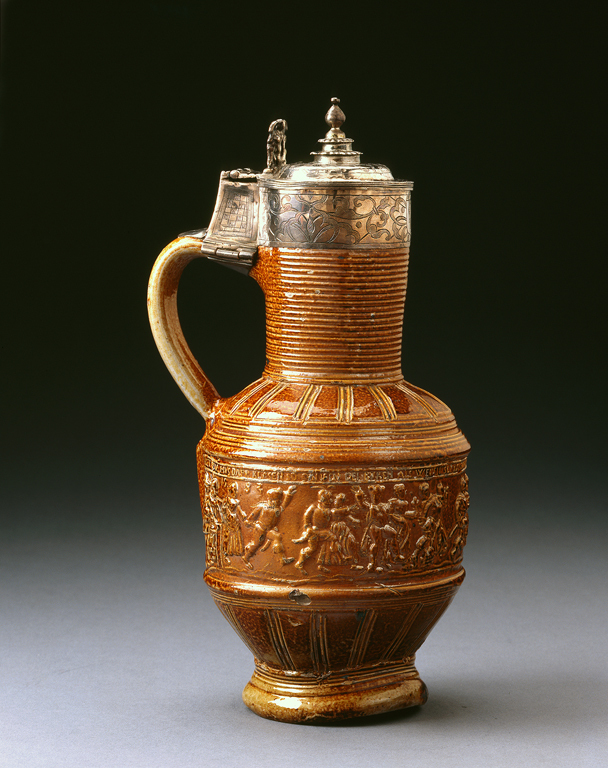 The frieze is made by a mold, and there are other jugs that used the same mold: the Ma href=”http://www.philamuseum.org/collections/permanent/50731.html?mulR=5915#&#8221; target=”blank”>Philadelphia Museum of Art has one, and two other examples have recently been sold at auction here and here. The scene is based upon the prints of The Peasant Festival by Hans Sebald Beham (German, 1500-1550). The easiest one to match up is the man who holds the hand of a woman and has his other arm raised, seen here (but reversed, because the mold would flip the design when impressing on the clay). At the very far left, you can just make out the two musicians also seen in the print. So, you can see that the development of stoneware was revolutionary, both in technology and in art. Next month, we’ll take a look at another example of another type of ceramic that shows the power of international trade and technology: tin-glazed earthenware. This entry was posted in Art, Curatorial and tagged Ceramics, Decorative Arts, stoneware, Stoneware vessels, vessels. Bookmark the permalink. Thank you for your detailed and comprehensive study, which makes so much about stoneware clear to me!